Florence Reece wrote the labor anthem "Whose Side Are You On?" She is shown here in 1985. Which side are you on?" By the end of the 1970s, the worker's anthem "Which Side Are You On?" would be on thousands of lips. But it was first penned in 1931, on the back of a calendar by a Kentucky union miner's wife as she walked the floor, watching over seven children while her husband hid in a corn field from coal company thugs. 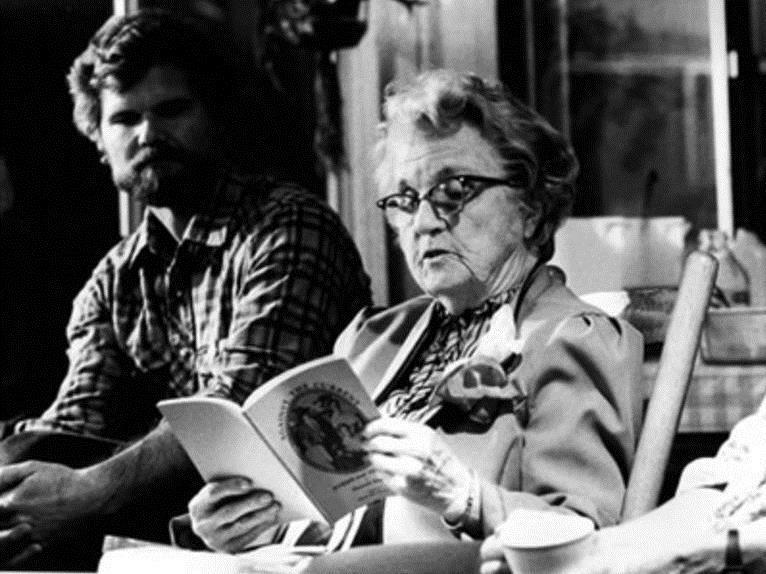 This week in Knoxville, two Appalachian historians shared stories of women like Florence Reece, Mother Jones and others who led struggles for social justice in the region for the past century. Jessica Wilkerson and Ginny Savage Ayers read from their books at the East Tennessee History Center for an audience of about 100 – including contingents of labor organizers and activists from the United Campus Workers and the Highlander Center, a Knoxville incubator for Appalachian grassroots organizing. Ayers, of Maryville, is author of “Never Justice, Never Peace: Mother Jones and the Miner Rebellion at Paint and Cabin Creeks,” the first full-length historical account of a strike that began the West Virginia coal wars about a century ago. Wilkerson's book, “To Live Here, You Have to Fight,” takes up the story of women in the labor movement later, focusing on social justice efforts that emerged from the War on Poverty in the 1960s and '70s. Wilkerson, an assistant professor of history and Southern studies at the University of Mississippi, grew up in Corryton and graduated from Gibbs High School. Passion for Appalachian history runs in the family; a distant cousin was one of the founders of the Museum of Appalachia. Wilkerson taught at Pellissippi State and Walters State community colleges before embarking on the doctorate that led to her book. Ayers co-authored “Never Justice, Never Peace” with her father, Lon Kelly Savage, who began the research and some of the writing before his death in 2004. Savage, who began his career as a journalist, had published a previous book that was the first to tackle the most prominent conflict in the coal wars. Ayers is a microbiologist by training. “But I read his draft and thought: 'This really needs to be finished,'” says Ayers. Ayers told listeners Thursday that “Never Justice, Never Peace” tells two stories. One deals with miners fighting for the right to organize and for freedom from “mine guards” terrorizing them and their families. Striking miners were evicted from their company-owned homes, and their mail was read as it passed through the post office in the company store. Their families lived in tents during the West Virginia winter. “It was not just about pay and conditions, but lack of control over their lives,” Ayers said. The book also tells the story of Mother Jones, an elderly labor organizer famous for her courage and feistiness. “Mother Jones was a hero in this social justice effort, but I also want to talk about the lesser-known heroes, the mothers and wives who took care of their families living in tents,” Ayers said. An example was Willie Fish, a teenage mother and miner's wife who used her pregnancy to conceal the guns and ammunition she smuggled across town to miners in broad daylight. The authors answered questions from the audience about what lessons from these female organizers can offer us today. Someone asked what would replace coal mining jobs, and Ayers said clean energy jobs should be considered. “Coal miners have been convinced either they work in the mines or they don't work at all, and I think that's just not the case,” she said. Wilkerson pointed to the West Virginia teacher's strike and said she thinks teachers should replace coal miners as the icon of the working class. Caitlin Myers was invited to respond to a question about the importance of broadband to bringing more jobs and options to Appalachia. Through a Highlander Center fellowship, she is is working on broadband access with a coalition of East Tennessee groups called Sustainable and Equitable Agricultural Development. Myers noted that part of the reason for poor broadband access in Appalachia is that companies like AT&T and Comcast don't think they can make a profit from it. Distrust of corporations was a theme throughout the evening. Ayers said the corporate mentality reflected in the coal corporations continues to harm Appalachia. As examples, she pointed to the Upper Big Branch mine explosion, which killed 29 coal miners in 2010, and the Kingston coal ash spill cleanup. “To Live Here, You Have to Fight” emphasizes how labor and environmental issues are deeply intertwined with women's lives. Lack of access to safe workplaces, drinking water, and health care made women's work of caring for children and (often sick or injured) husbands much harder: Women essentially subsidized the cost of business for the coal operators and their powerful allies. The book focuses on women in Eastern Kentucky who were at the vanguard of activism that linked caregiving to citizenship rights. One of them was Sue Ella Kobak, who attended Thursday's event and spoke passionately about how these struggles continue. But the most devastating corporate attack on Appalachia, she said, is opiate addiction – a problem she said was primarily created by Purdue Pharma, the company that heavily marketed its addictive drug oxycontin in the region. Kobak and her husband, whom she said works 70 hours a week treating opioid addicts, began challenging Perdue just a few years after the drug became available. It doesn't matter if new jobs replace coal jobs, she said, if people aren't sober enough to be hired. “We can't even get people to work in convenience stores because they can't pass a drug test,” Kobak said. Many listeners said they were inspired by the continued activism of women like Kobak, who is in her early 70's. Sponsored by the Knox County Library, Union Ave. Books, and the East Tennessee Historical Society, the event was followed by a book signing.